I've wanted to make a zerg theme, and start button for a while, since starcraft is my favorite game. its hasn't been completely cleaned yet, and I have a few kinks to work out, and features to add.. but it doesnt look bad Id say. So ill probably be updating it soon. Terrific. I had to download a demo to figure out what the menu is about. Very high definition. Even a built in shadow. Like those winding snakey worm creatures. Looks like many days of hard work, doing layers as well. I gather .xcf is a Gimp file? I wonder if it's a good idea to upload a CSM backup XML configuration file? That way we can have it set up the way you have it. Can the XML file be used on another computer? The only big kinks that I see to be ironed out, are the submenu bottom padding or slices is wrong amount. Looking at submenu bitmap 400 by 412. Slices add up to 430, instead of 412. That's an easy fix. The name text location is a bit off as well. Something odd with the cutting off of the center rod. I'm sure you know these anyway. Got to say, hope this gets more skinners to come forward with their own. Does take patience and time though, as I'm guilty of lack of those, these days. Not sure what you mean by cutting the center rod? And thanks for the tip on the submenu. I threw the .skin file together in like 20 mins so i figured there would be some errors to iron out. First I thought it was the slices that's off for Mr. wormy in the middle column. making a dark transparent line. That may be your intent, I don't know. Good job with the buttons. I should have zoomed in closer for the picture. Sorry. Use the Ctrl and the mouse wheel to zoom in the web page. Nice! Have you made the changes yet? You also need to be churning out new themes! You're one of the few people here that knows how to make these, and you make them well! I'd like a Star Trek Voyager or TNG skin in this vein if you'd like to make it. I think I made a few of the changes on my local copy though I havnt done most of them, and I kind of abandoned it due to time/effort required. I may eventually pick it back up or even include terran/protoss variations, but I doubt its worth the effort. The main reason I did it was to see how it would turn out. Well I'm afraid I can't do that. I don't have the imagination/skills required to do that. But I do have another project here that contains most of the files you would need. Does it look too daunting? Va va Voom. What a queen. Some of those additions elsewhere sure give menu image, a moist wet look. The big part on left bottom looks dryer. I tried a plastic filter (exaggerated) on part of it, to see if it gets shiny. Now it looks like wet internal organics. The middle column border looks better now. The "STARCRAFT" text can be a floating emblem, so it won't stretch. Another new feature is png can be used instead of bitmap. No need to convert image. It might reduce the size of skin. and Yes your changes do make the bottom boarder look more slimy and organic..
About the second column, if non stretching background custom image used. It's not a cure all. It would be difficult to stay in registration. Only thinking, not trying. As far as I know, there is not a separate starting point for drawing a 2nd column custom image. The mask for second column would be used, but image would still start out in top left corner of first column. Would have to add extra mirrored texture to the left, to fill in space. It won't keep alignment with fluctuating text width first column. I think I might try it just to do it; though IMO the stretching is pretty minimal for everything with a reasonably dimension-ed start menu..
Have red image pattern mask for 1st, green image for 2nd, blue for ? Each image will only show where its mask is, but all will start from top corner. But yeah, even if background is normal stretch, there is nothing in bakground image that tells ones mind of a wrong proportion. It's all alien. Brain just accepts, does not compare to anything else from brains memory. Only the spiral, zergling looks better with unstretching emblems. Your menu skin has got to be the most complicated looking skin out there, anywhere. I would need to align Kerigan top-center for it to work properly. Ive sent a PM to Ivo, and ill put this skin on hold for the time being. I don't know enough about emblems, when they are large size. Do they extend past menu, or get cut off, or start to shrink limit? and can't move any more from large size. Did quick test. I changed text to center, and played with padding. Hardly any difference. I think the image has to be smaller to work. What a sight though. So commanding. and not move when columns expand, and contract? Hey if the latter, can she be the top unstretching part of a vertical main separatorV image instead? I've made some mistakes in past with wrong bitmaps used as separators. It might work if the middle and bottom separator slices are invisible? Scratch that. Forgot about the padding. Yup; this is the emblem I'm using; unless I can align it based on the stick dividing the 2 columns; itl never align properly. Im still prodding to see if there is a way to attach to the right side of the left column. The queens size is quite awesome. Yes. Smaller would not be as powerfull looking. Looks ok offcenter in screenshot. If an emblem touches another emblem, does one go behind the other, like a layer in photo program? That would be great if it does, then the two tops of columns could be separate. The left behind zergling, and one on right in front, with the queen sliding horizontally behind the top right emblem. Could even intergrate a user picture frame with horizontal environment clouds, or something to blend with the theme. Yes, emblems are layered; and I am resuming work, because Ivo has given me the verbs necessary (they just weren't documented in any example) They are right1 or left2. just dropped by and wanted to say you guys are doing inspirational work. i've heard skins are possible for the desktop … but never thought it would go to this extreme. you guys are writing whole new chapter. well done … and gotta' say love that goth-queen or bat-queen. Hi, this looks amazing. 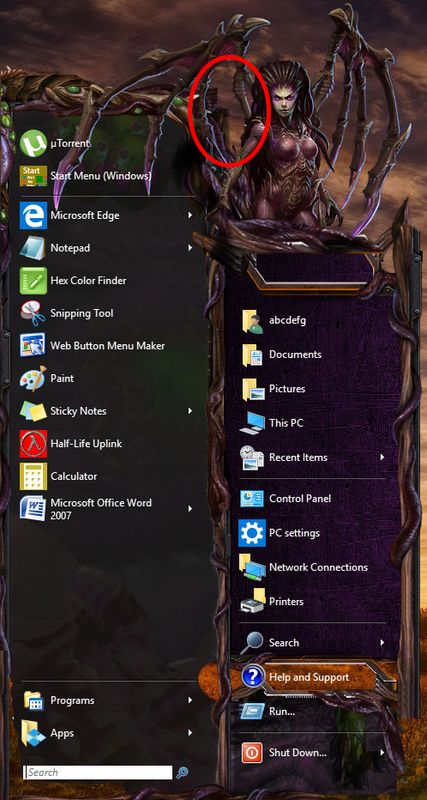 I remember that I had trouble adding icons to a .ini file, and now look what you can do with a start menu. This is pretty cool. StarCraft is a very fun game, I used to love playing it. I was always Terran in StarCraft 2. I laughed at you saying neversoft because I used to play Tony Hawks pro skater 3, it was one of my favorite games back then as well. Is it supposed to be a .skin file? Or a .skin7 file? I changed the file extension, and it seemed to display properly on both. The skin text was black though. You can add icons to both the left and right side? I didn't know that. I also didn't know of the emblem aligning options , like left1 or left2. I've thought about that myself. The user would have to crop their image just right to work though. Last edited by juniper7 on Sat Aug 20, 2016 7:08 pm, edited 1 time in total. it was just a comedic idea, that would imo detract from the aestetics and seriousness of this particular skin maybe if someone made a carnival based skin or something, it would fit right in. I think it's time to do a massive cleaning of my computer for people I know little about. Deleting uploaded image as well-gone. or somewhere when the user image was enabled, and have the user image be mostly-visible through the translucent green membrane? To what end? a user-picture? Im not sure if it would be aesthetically sound to do so. Also cocoons are gray and dull and IMO break from the skins design elements. Maybe menu does not need a user picture at all? Will be hard to fit in well with the theme. What about down at bottom of menu? If it is in the invisible top part of menu, she needs her free space. Would have to be subtle, not stand out, say on left. It would really depend on the desktop background picture as well, for it to blend with everything. that only lets 10 % of user picture (user mask) show through frame. Wonder what it would look like with some semitransparent horizontal ether clouds? Hi, I agree with the nameplate idea. Also, the idea about the queen of blades wielding a sword that skewers the nameplate I think is a very cool idea as well. If you did a .skin7, there's a bug with the jump list, and search pane. When you do a search, or hover over an item for recent programs/files in the 1st column, emblems disappear on you, and the column 1 stretches to accomodate your jump list or search query items. Column 2 seems to be missing, along with your emblems you made. Should I make a bug report? At first I thought that the 'help and support' button 2 images up had a custom mouse hover select image for when its selected by the mouse. So I thought, you can make custom selector images for the start menu? But I'm not sure if that's possible. Yea it sounds like an issue with classic shell, rather than my skin; though its odd that the issue would be with .skin7 because the only official skin to even use emblems is a .skin7 file so one would think it would have received more testing than .skin. The stretching sounds intentional. and is part of why I designed the skin with emblems, and patterns so it can better support stretching. If an emblem is tied to the second column (using left2, center2 or right2), then it will disappear if there is no second column, like during search. This will make it left-aligned to the second column, or right-aligned if there is no second column. This is a 4.3.0 feature. Ok; yea I hadn't thought of the dynamics of windows 7 style when search is used.. it needs to be visually appealing in single column mode (something I was not planning on supporting) though since you specified secondary alignment; and i kinda want to break into the windows 7 style, i guess ill have to make it work I'm assuming secondary alignments work with classic(1 column) in a similar manner as windows 7 style with search (so transition work should be minimal) either way this iteration will probably focus entirely on getting everything working with classic+2 column only. and ill probably take a long(possibly indefinite) break between it and the skin7 style. Looking good. Can't wait to see the finished product! Could you PLEASE make a winter themed start menu! I just kinda stopped working on it (Im not a personal fan of themed start menu's, I did this to test the limits of CSM) the latest version (zergmetal3.skin) should be attached to one of the post. Though I've had quite a bit of free time lately.. I might fix a few of the odd bugs like the user-image. I think I do like Kerrigan though too. Both are good. Good to see new creative ways happening. Good incentive for me to try again with the old flat Start trekkie skin. The John Smith one was a mockup? I thought it was the real thing. Yeah, I liked that one. The last image only 'works' because the width of the right column is fixed. so you like the 'john smith' one best? I think i might too actually (I don't wanna get rid of kerrigan), but it needs a more zerg-like border (a shiny chrome ring hardly fits this theme) but maybe that doesn't matter because its just a transitional element? It might be possible for me to include a 'fake' user-image by adding a setting that allows the user to include an image. The user however would have to format it properly to fit (IE round the edges, and make it the exact resolution needed) but this wont be clickable. How Do You Make Start Menus?? Jcee.